How is it even Friday already? This week has just flown. Do you have any fun plans? It’s our wedding anniversary this weekend so we will be taking it easy. I started by placing 3 strips of striping tape horizontally on my pinky, index and thumb and 3 strips of striping tape vertically on my ring and middle fingers. I then used Sinful Colors – Black on black over my pinky, index and thumb and removed the tape immediately afterwards. 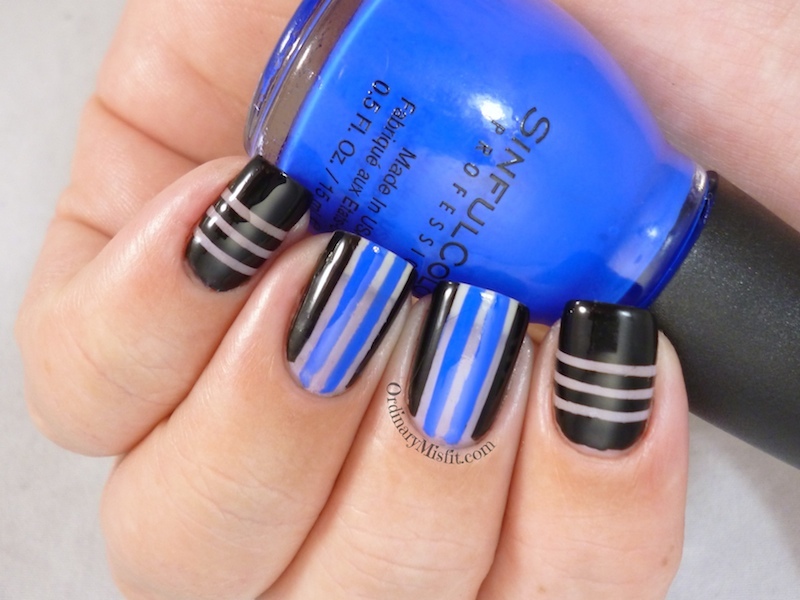 In my middle and ring fingers I used Sinful Colors – Black on black on the sides and filled in the middle with Sinful Colors – Endless blue pulling the tape off immediately. Topcoat and done. I am not sure if this works but I like it enough. Let me show you the colours I used. This is 2 coats with no topcoat. This is by far my favourite black that I have used so far. Granted I haven’t used many but why fix what isn’t broken right? It is opaque and great formula. This is 2 coats with no topcoat. Great formula and great opacity. I love this blue so much. It is so great for summer but also works well in winter for a pop of colour. Love! What do you think of the negative space? Do you approve Jane? Have a lovely weekend! Love it. Your nails look so healthy underneath! I love your mani, brilliant colours! As you saw, I went for something different, but still – did you find striping tape as INFURIATING as I did? Catherine Dream recently posted…Fancy a Cuppa? You are braver than me! These are cool! I am afraid of negative space designs, too, yet I always think they look cool, so…what is my problem? Haha. I know right? It’s so bizarre. I know I was afraid of exposing my naked nails but I think it looks ok.